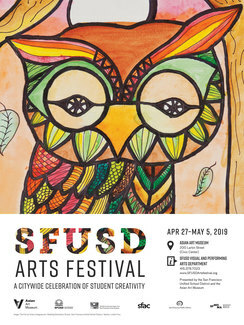 Join us for the 33rd Annual SFUSD Arts Festival, showcasing children's visual and performing arts in collaboration with the Asian Art Museum! This 9-day festival has been formally recognized by the Kennedy Center in Washington, DC as the model for children's arts festivals in large urban cities. Life-long arts advocates Anne Marie Theilen and Ruth Asawa created the festival which combines the talents of San Francisco's school children with the museum experience. For more info on Anne Marie and SCRAP (also founded with Asawa), please click here. We are looking for volunteers to help with the festival. Our volunteer opportunities are varied and can fit into your schedule. In appreciation for your volunteer service, you will receive a festival poster and an invitation to the Gala Celebration which will be held on Thursday, May 2, 2019 from 5:00 to 8:00 PM at the Asian Art Museum.